Another masterclass in event organisation from Ken Robertson and his team saw the Mid Devon CC promote 3 stages fn the Elite Road Race Totnes Vire over two days plus a 3/4 support race! The weather was generally unkind and the 2nd day even had the races stopped by a trailer of live chickens escaping! 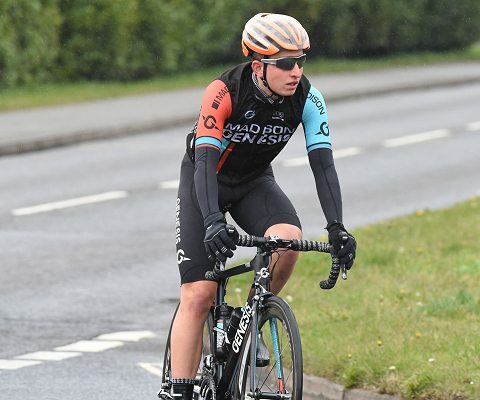 Matt Holmes took overall victory at the Totnes-Vire two day with Gruff Lewis third, as team work paid dividends in Devon. Holmes sealed the win on the third and final stage, making the main group and sprinting to third place – but it was the erosion of overnight leader Adria Moreno (Raleigh GAC) that set up the opportunity of victory. Entering the race, the team knew they would have to expose the Raleigh GAC squad – but nowhere was that more important than on the final 72-mile test. Madison Genesis went to the front in force to bring back the days breakaway and on a hairpin bend forced a split in the bunch. Holmes was caught in the third group on the road – but more importantly so was Moreno – and as race leader, it was his responsibility to regain contact. Holmes could conserve his energy as the groups were brought back together by a hard-charging Raleigh GAC squad. 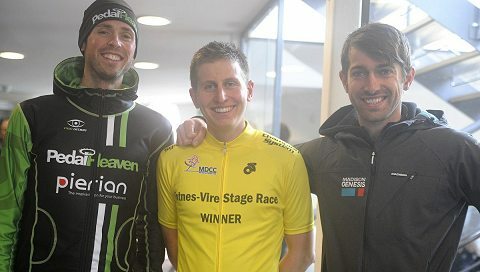 Holmes started the three-stage race with a second place in the opening road race, finishing the 57-miles behind Dexter Gardias (Pedal Heaven), as the duo sprinted to the line ahead of a much-depleted chase group. The ride put him in prime position to contest the overall standing and following a strong time-trial, the chance to take the yellow jersey remained alive. Great ride from ex Mid Devon CC Junior rider Charlie Meredith to take 8th on Stage 3 and 10th on GC. Spinning that 52/14 on those descents!